Right. So. Semi-new site. Semi-new layout. Let’s get this party started with, of all things, a hardware review. Since this requires typing; that hardware review might as well cover a device I really picked up for my on-order Jolla Tablet. Specifically Sharkk’s Bluetooth Backlit Keyboard; a keyboard largely chosen because of it’s reasonable price and feature set. Across games like Terraria, Planet Explorers, Dying Light, Dead Island, L4D2, and Savage Lands, there was little to no difference in response times compared to a wired keyboard. The keyboard also seems, to date, to be capable of keeping up with my own relative typing speed. Exactly how fast I type I’ll leave up to the imaginations of the readers; but those who have seen some of the rapid fire responses on G+ probably understand why I prefer mechanical keyboards over membranes these days; but I’ll come back to that in a bit. The next criteria then is battery life. A wireless keyboard isn’t much good if it drinks batteries as fast as I land headshots. Again, the Sharkk keyboard delivered; easily reaching the manuals estimated backlight-active time of 5 hours. This particular figure seemed to be based on the 800mA battery experiencing a maximum 2.5mA drain; which works out to around ~5.3 hours. The one I have in hand kicked the proverbial bucket somewhere around 5 hours and 10 minutes. With the backlight off the battery life appears to be, well, significantly improved, lasting well past 6 hours. For most casual user cases the battery life would seem to be sufficient; and even an inexpensive powerbank could push the Sharkk keyboard into all-day territory. Emphasis on *could* as the charging port location is a bit… annoying. Really. If I’m honest. The Sharkk keyboard places the charging port just under the right-hand upper side of the keyboard. For those using the keyboard while it is charging or hooked to a power bank the positioning places most USB cables right in the path of a right-handed mouse user. Which leads into my final criteria for reviewing; the day to day experience of actually using the Sharkk keyboard. For the casual user there isn’t a whole lot to complain about. Even for my own legendary keyboard-melting typing skills I was not severely impacted by the size or primary button layout. There is a bit of a caveat here in the size though. Those who found the original Xbox Controller, or the Split Fish PS3 controller for that matter, to be perfectly sized will likely have issues with the Sharkk Bluetooth Keyboard. From the perspective of an average user or gamer looking to pick up something for their Android/Linux devices, their SteamOS/Debian devices, or just to have available for that secondary device running a legacy operating system not based on Linux; there isn’t much; if anything; to detract from the Sharkk keyboard. 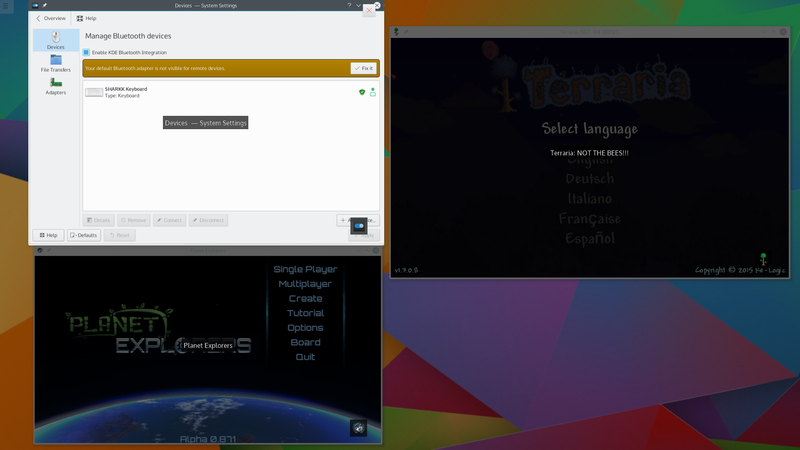 Some of the functions intended for Android/Linux work surprisingly well on KDE/Debian/Linux. Case in point; the upper right corner of the keyboard features a key to lock the system. Hit that under Tanglu, a KDE/Debian/Linux distribution, and the system initiates Log-Out. Hit the Search key and Krunner pops up. The Function Keys along the top of the keyboard feature alternative controls for media player volume and playback. These worked flawlessly for Amarok and VLC. 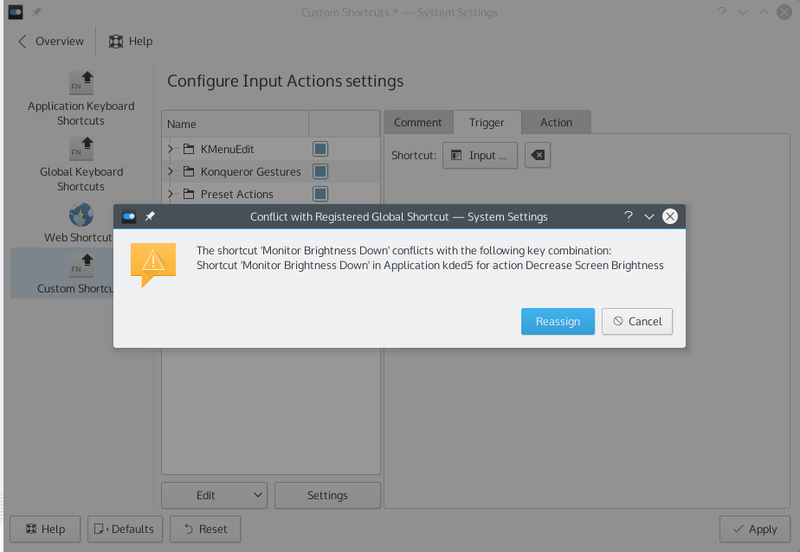 A quick test against a ChromeOS/Gentoo laptop and the screen brightness keys worked exactly as indicated as well. The non-accessible Function Keys rapidly bring to a halt non-casual use. Even commonly used programs like LibreOffice become nightmares to wield without even basic Function shortcuts. That makes the current Sharkk Bluetooth keyboard quite the hard-sell. 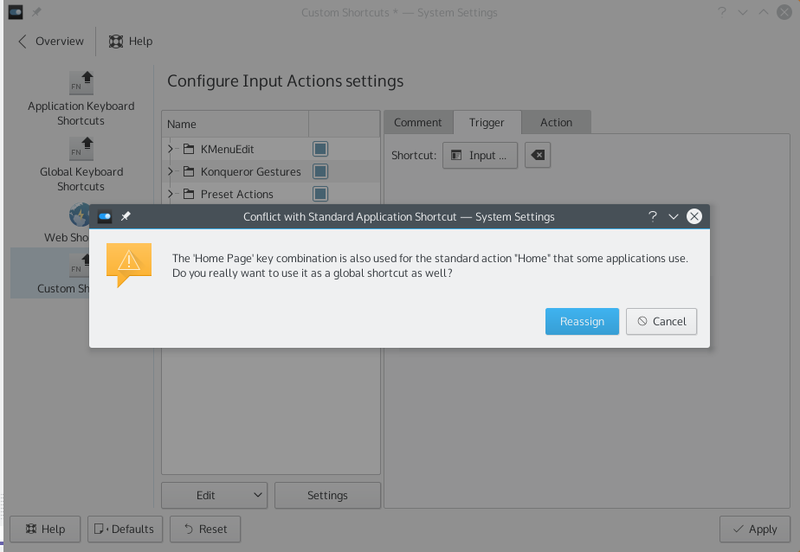 In fairness KDE does have an extensive array of shortcut customization options so it didn’t take long to create new series of global short-cuts to work around the limitations of the Keyboard itself. If I had a line into Sharkk’s engineering staff for a version 2 keyboard: my advice would be pretty simple. First; Re-locate the USB port so that the keyboard can be charged without interfering with either right or left handed mouse users. The second would be to adjust the board’s firmware to ensure that the Function Keys and their Alternate system calls can be swapped through an in-firmware key combination. This already works as expected with the Escape key; so I’m not sure why the board I have in hand doesn’t work that way with the rest of the function keys. Beyond that? This has actually been a fun little keyboard to play around with. The build quality is solid and the board itself really comes across as good value for money. I should probably also mention in line with value that the keyboard did come with a rather fetching carry bag. I mention this because a Razer BlackWidow Tourney keyboard also comes with a carry bag; but one significant difference. The Razer bag contains a sub-pouch for the storage of the USB cable. After seeing that little design detail like that it felt a bit odd to note that the Sharkk carry bag lacked such a feature. Just a small note. Would I buy another Sharkk Bluetooth Keyboard? Well, not unless I knew that the Function keys actually worked properly across the major operating systems.